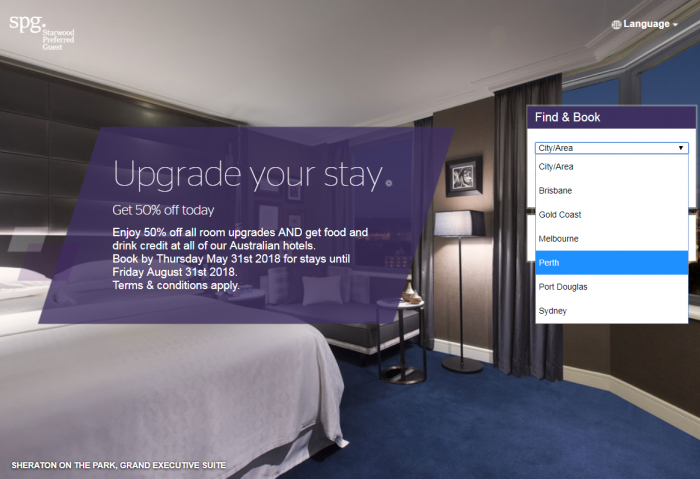 SPG has launched new Winter sale for stays at participating hotels in Australia where members can get 50% off room upgrades + F&B credit. The offer is valid for stays through August 31, 2018, and must be booked by May 31. Note that this promotion appears to be only valid when you book premium rooms. It is bit unclear from the T&Cs exactly what the F&B part of thus promo is. If you have Platinum status with SPG, you would like to get the upgrades that are part of this rate plan on a complimentary base, so take that into account. Offer is valid for stays booked between March 27 – May 31 2018, for travel completed before 31 August 2018 at participating Starwood Hotels & Resorts in Australia. Offer is only available on rate plan DAILY20. Food and drinks credit will vary by hotel. One night minimum stay applies. Credit card charges may apply. Discounts offered vary across the participating properties. The maximum discount stated in promotional materials may not be available at all participating properties. Additional SPG member discounts are available at selected properties and may vary. An eligible stay is defined as one or more consecutive nights paying a qualifying rate in the same hotel regardless of the number of check-ins or check-outs that occur. Offer not applicable to groups or in conjunction with other special offers unless explicitly stated otherwise. Starwood Hotels & Resorts is not responsible for omissions or typographical errors. All promotions associated with Starwood Preferred Guest® are subject to the general terms and conditions of the Starwood Preferred Guest program, which are subject to change without notice. Full terms and conditions of the Starwood Preferred Guest program are found at “>www.spg.com.